A Russian IL-20 aircraft was shot down 35 km off the Syrian coast in the Mediterranean sea killing fifteen service personnel. The Russian military has now released a statement claiming it was friendly fire from a Syrian S-200 surface-to-air missile but blames "Israel" for putting its aircraft in danger with their random air-raids. In a previous version of this post I had accused "Israel" of shooting down the plane, but was then compelled by Dimitriy Koralev's superior reasoning as to why that seemed unlikely. "Israel" and France have been firing cruise missiles at Syrian territory, missiles which are designed to attack ground targets, not take down aircraft. This opened up the possibility that Syria, while taking aim at "Israeli" planes may have accidentally missed it's target, and then locked on to the Russian plane. Both Syria and Russia are the defenders in this war, meaning therefore that their surface-to-air missile systems are constantly active and 'twitching'. The aggressors by contrast (NATO & "Israel") are motivated, NOT by a need to defend their territory, but to bleed the Syrian military. Yes it's true, Syria has an IFF (Identify Friend or Foe) system allowing it to theoretically differentiate between friendly Russian and enemy "Israeli" planes, but those systems can also malfunction. To quote one of the Russian commanders of the 2008 Russo-Georgian war, Vladimir Shamanov: "In South Ossetia the IFF system in fact did not work, and it was very hard for our units to recognize whose equipment they were seeing—ours or Georgian." Before this acknowledgement of friendly fire, there was a suggestive RT report which read that the Russians "lost contact" with their jet "during an attack of Israeli F-16 fighters on Latakia" and that their aircraft was responding to "recorded rocket launches from the French frigate Auvergne". All of that is true, but the report stopped short of pointing fingers. Why would "Israel" (or France for that matter) bother shooting down a Russian plane when they were already getting away with bombing Syria, without being hindered by Russia? Two weeks ago "Israel" admitted to launching over 200 strikes inside Syria against what they claim are "Iranian targets" over the past 18 months. Their intentions are to make it seem as though they are being encircled by Iran which is complete garbage. "Israel" launches airstrikes against Syria because it wants to bleed the Syrian military on behalf of the forces trying to overthrow the central government, not because it feels threatened enough to shoot down planes. Besides, for reasons that are historical and cultural, Russia and "Israel" have shown little aggressive intent towards each other. Regardless of the confusion, the Putin-Erdogan deal reached yesterday offers possibilities for Syria to win without fighting as much, through diplomatic means, potentially saving the precious lives of its soldiers. 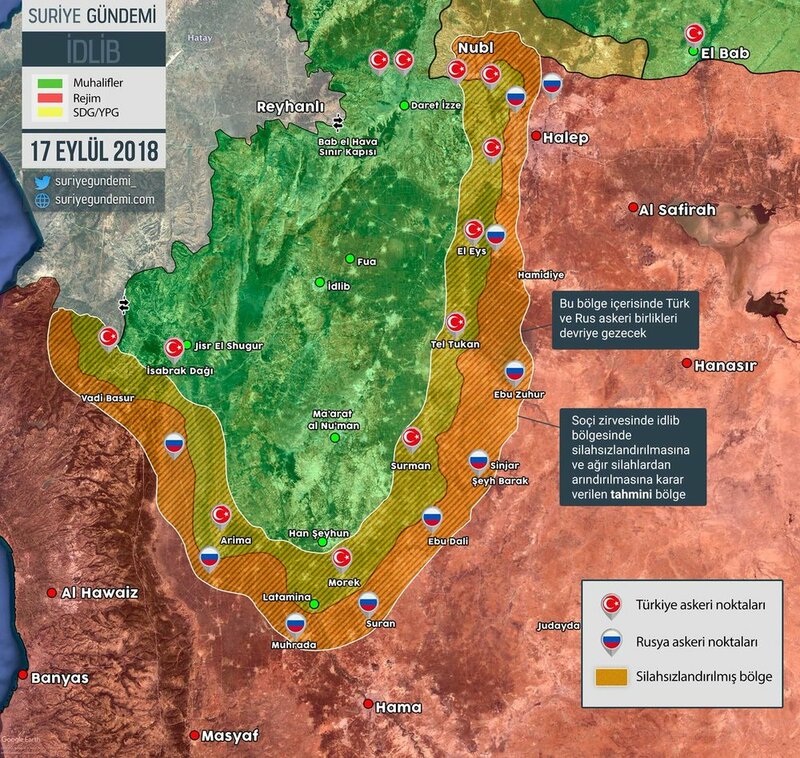 The deal isn't just about freezing the battle-map, it also obliges Erdogan to assist in the "withdrawal of all radical fighters", namely Hayat Tahrir al Sham (HTS), which used to be Syria's official Al Qaeda franchise (Al Nusra) until it disaffiliated so the White House could call them "moderate". Al Qaeda (HTS) has every reason for calling Erdogan a traitor because there's no way this deal can be enforced without provoking a war between HTS and the factions more loyal to Turkey, including all those actual full blown foreign Turkic militias, but we'll have to see how that plays out. Worst case scenario, HTS simply re-brands and the deal falls through, but I can see why it's worth a shot, especially since Erdogan knows Syria has won.